California has a diverse range of microclimates. 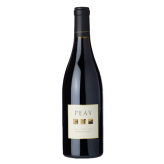 Peay Vineyards is located in the far northwestern corner of Sonoma County, approximately 4 miles from the Pacific Ocean, near Sea Ranch. The vineyard is situated along the coast, but not on the first ridge. The winery sits along a partially obstructed avenue formed by the Wheatfield Fork of the Gualala River that allows for some fog and copious cool air to seep through. The vineyard sits on a hilltop, just at the top of the fog level; low enough to be cool and stable, but high enough for the dry conditions needed to grow healthy grapes. The hilltop vineyard expresses many subtle variations depending on aspect: some sites catch the afternoon breeze with full sun, others rest lower on the slope with greater fog influence and less sunlight. This is cool climate for grape growing, just on the margin. The winemakers cross their fingers hoping that the fruit will ripen before rains start in late October through early November. In some years, ripening is a challenge. With the knowledge of an experienced vineyard manager, these challenging conditions produce superior fruit. A long growing season with moderate temperatures maximizes the production of intense flavours and phenolic compounds that result in complex wines. The wines will always have plenty of acid to provide structure. No flabby, overripe wines here.